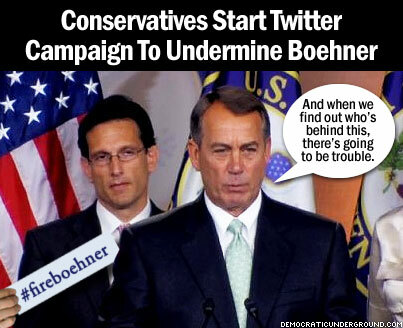 The #FireBoehner hashtag really took off last night on Twitter. No, it wasnt started by evil liberals  it was the conservatives at American Majority Action (AMA) who started it. The gang smelled blood and the sharks are circling. The Daily Caller was promoting their version of online activism to dispose Boehner of his speakership. Theyre mad at a secret list they think Boehner used to purge several real conservatives from House committees. Republican Reps. David Schweikert, Justin Amash and Tim Huelskamp come up often in these circles, with Freedom Works urging members to call Boehners office in order to instruct him to stop kicking real conservatives, such as the above three, from committees. Conservatives suspect that Speaker Boehner (R-OH) was behind The Republican Steering Committee (Boehner chairs it) voting to remove Reps. Justin Amash (R-MI) and Tim Huelskamp (R-KS) from the House Budget Committee. Who is going to tell these angry conservatives that it is reasonable to assume that Amash and Huelskamp were kicked off at the request or at least mention of Paul Ryan (R-WI), their hero at large? Ryan was after all kept on by the very same Steering Committee as budget chairman, in spite of his inability to do math on the campaign trail. See, Amash and Huelskamp voted against Paul Ryans budget because it did not cut spending enough. Yes, that budget  the one the nuns protested for immorally cutting funding to needy Americans. These two are quite literally destroying the Republican Partys image (as if that was hard to do at this point). Party leadership must feel they had to be cut off from having the ability to obstruct the GOP from making deals they need to make in order to spare their reputation more damage (read: fiscal cliff deal). No doubt Boehner agrees that these guys have to go if the Republican Party is going to have a fighting chance of not taking the total blame for yet another fiscal cliff/debt ceiling debacle. Boehner is not stupid. He has been, however, ineffective as a Speaker, but hes also been placed in a horrible position by the Tea Party and he waited too long to grab the reins. He knows his career is on the line, and thats why hes threatening panel assignments and reminding his party that leadership is watching their votes. In typical Republican fashion, the Party let the losers learn about their ouster the hard way  with the public, on the Internet from the media. Not cool, but this is the Republican Party. Authoritarianism is all fun and games until youre on the wrong side of it. So the conservatives plan is to get 16 Republicans to refuse to vote for Boehner for Speaker in the new session, so that they can get real conservative ideas passed. Now, by real conservative ideas, we are not talking Paul Ryan crazy, but rather worse than Paul Ryan. Believe it. The insanity among this bunch is beyond astounding.